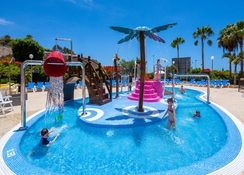 The Tagoro Family & Fun is a four-star hotel situated near the sun-kissed beach of Costa Adeje. It is a firm favourite with UK holidaymakers. With top amenities for families, including soft play centre, children’s pools, kids’ clubs and 24/7 entertainment. The hotel is a hit with parents and kids alike. Low rise pretty buildings make up the resort and there are plenty of activities to enjoy – plus all that Tenerife sunshine and beaches just 1 km away provide captivating sea views from the rooms. With volleyball, tennis, live music, cultural shows and a range of restaurants, the Tagoro Family & Fun offers the best of island fun under cloudless blue skies. Enjoy modern and comfortable apartments and amazing views of the sea thanks to a lovely elevated location. Relax on the beach or have fun at one of the nearby water parks. The Tenerife South Airport is only a 30-minute drive. 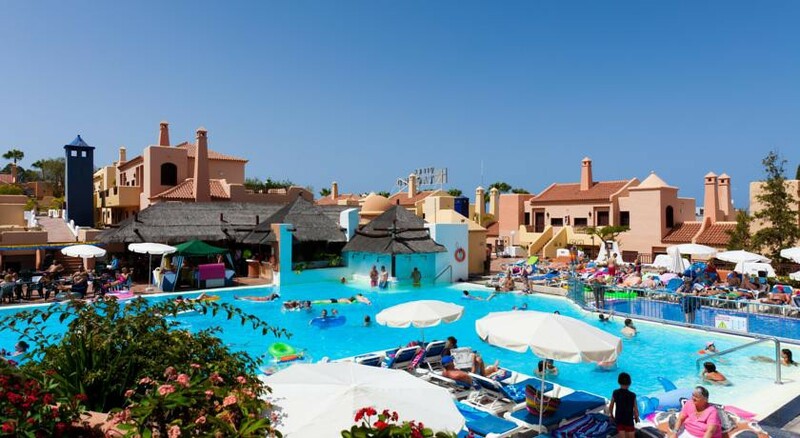 Dream Villa Tagoro Hotel is a great choice for a stay in sunny Costa Adeje. The Tagoro Family & Fun sits on a small hill and is a mere kilometre from a sandy beach. The theme parks of Aqualand and Siam Park are within an easy walking distance. The nearby towns of Golf Las Americas and Playa de la Americas are a short drive away. Tenerife South Airport is only 17.3km from the hotel. There are many flights to Tenerife south from all across Europe throughout the year. The Tagoro Family & Fun has comfortable standard, family and premium rooms. These rooms are equipped with en-suite bathrooms, balconies, Wi-Fi internet, air conditioning, safe, kitchenette, dining table and chairs, furnished living room, TV with satellite and couch/sofa. Daily housekeeping, fresh towels and linens are provided in the rooms. Private balconies provide excellent views of the poolside and the hills. The main buffet restaurant serves a menu to suit all tastes. The continental breakfast offers lots of variety, and lunch and dinner feature a lavish spread. The cocktail bar serves all types of alcoholic and non-alcoholic beverages. The area around the hotel is dotted with several restaurants and bars offering a wide variety of cuisines including Spanish, Mediterranean, European, Italian and much more. A large outdoor swimming pool and kids’ paddle pool feature among the hotel attractions. There are activities such as water polo and water volleyball hosted near the pools. There is a mini club for kids aged 4 - 12. Other sports facilities include a games arcade, basketball, darts, archery, mini golf, mini football, shuffleboard and volleyball. In the evening, the hotel entertainment team hosts lively programmes and dance parties. This hotel may not be suitable for those with walking difficulties. We had a wonderful 10 night break here. Room lovely, simple but kept very clean, wonderful to have such a large outdoor terrace. Went with my husband and 2 year old son, he loved it. The kids pool was a little too cold though so he preferred the main pool. Food was ok, repetitive and being a fussy eater never found I had a proper meal, but always found something to get by on. Entertainment was fab, although think the nighttime kids entertainment was a little late and found the little ones were getting grizzly by that time. Day time entertainment for kids was brilliant, fantastic kids club and staff exceptionally friendly and brilliant with the little ones. Overall had a wonderful stay and would return. We had a great time on a 4 Star Family Villa.The staffs were so friendly and helpful.They even upgrade us to a better room and gave us a free champagne 🥂 when we made a complained in our first hotel room which wasn’t airy enough.We would love to come back again to the same hotel.Definitely we will recommend it to our family and friends.The restaurant served various food on every meals and also diffierent menus everyday from Paella,to Chinese food..etc..Endless delicious food.We are always booked our holiday with teletext holiday as it’s value for money and excellent hotels and customer service is high standard.Always a loyal teletext holiday makers our family.We booked another holiday with teletext holiday on September 11-25,2018 to Crete,Greece.Great Job! Teletext! An amazing hotel, staff really helpful nothing was too much trouble, food was first class, entertainment all day and the complex including rooms were spotless, went twice in 2017 going back May 2018.